"I called up several landlords who had listed rooms for rent," Sunil, a Sri Lankan who spent eight years living in the UK, said. "Things would start out OK, maybe because of my [Western] accent - but the moment they heard my name, they'd blank out. Many said 'sorry, we don't rent to these people', or 'sorry, no room for Indians'." "I told them that Sri Lanka was not India, that I wouldn't eat or cook in the apartment, and that I would be outside all day. But still, they wouldn't offer me a room," he said. "At that point, I got fed up and decided to only try Indian landlords. I was invited to viewings right away." Sunil is not alone. A quick glance at online rental listings shows many that include the words: "no Indians, no PRCs [People's Republic of China]", sometimes followed by the word "sorry". One Indian expat said his agent told him that many landlords would refuse to rent to him because "Indians always cook smelly curries". Another Briton of South Asian descent did not experience any direct discrimination, but was warned by his agent that some landlords could be difficult. "It doesn't matter," she said. "They may still think you're a PRC who obtained a British passport." Mathew Mathews, a senior research fellow at the Institute of Policy Studies, says: "There are stereotypes that people have about different immigrant groups and how responsible they are in terms of the upkeep of a rented apartment. "There are notions of which groups take care of their homes better, and what cooking supposedly leaves permanent smells in the house. People have notions about what would devalue the property." Charlene, an estate agent, said it was common for landlords to prefer not to rent to tenants from India or mainland China because such tenants "are not people who are house proud". "Many don't clean weekly, and they do heavy cooking, so dust and oil collect over the months. They may use a lot of spices that release smells people don't like." There are also fears that those tenants will illegally sublet to others, she said, adding: "Cleanliness and culture is a very strong factor." While many landlords appear to be concerned about heavy cooking in their kitchens, tens of thousands of Singaporeans launched an online campaign to "cook a pot of curry" in August 2011. The campaign was prompted by media reports of a disagreement between a Singaporean Indian family and an immigrant family from China, over the smell of curry from the Indian family's home. Following mediation, the Indian family agreed to cook curry only when the Chinese family were not home. "At that point in time, there was a sense among people that there was some kind of injustice committed," says Alfian Sa'at, a local playwright who wrote the play Cook a Pot of Curry (pictured) following the incident. "People felt it seemed as if it was OK for [the foreigners] to somehow reject curry, which a lot of Singaporeans believe is part of Singapore's society, no matter what ethnic background you're from. There was a sense that the government had favouritism towards new immigrants at the expense of native, Singapore-born residents." However despite the support expressed for the Singaporean Indian family, it appears that both race and nationality remain important to many landlords. "It is likely that people tend to want to rent out only to people of the same race," Mr Sa'at says. 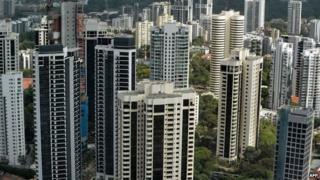 "This is a tricky issue, because obviously a lot of landlords are [Singaporean] Chinese." Eugene Tan, Associate Professor of Law at Singapore Management University, says: "In the current state of ambivalence towards immigration in Singapore, my sense is that race and country of origin have taken on a stronger accent with regards to how landlords may view Indian/PRC tenants." Singapore's government places a strong emphasis on racial harmony. Studies suggest that there is relatively little racial discrimination in the public sphere, but things can be different in private. "The Singaporean state has considerably influenced Singaporeans' willingness to work and be alongside those who are racially different," Dr Mathews says. "Singaporeans have learned to accept the realities of living in a multi-racial and multi-religious society. The private sphere, however, is one which the state has not tried to influence." A landlord's choice of tenants "would probably fall within people's private spheres in terms of who they would choose to come into their home space". Attitudes to race came to the fore in December, when hundreds of foreign workers from India and South Asia rioted after an Indian national was killed in a bus accident. The incident sparked a strong response on social media - many made comments denouncing foreign workers, although many others also spoke out against racism. Of course, rental discrimination exists in many countries. A BBC study in October found that several estate agencies in London would refuse to rent to African-Caribbean people at the landlord's request. However, while the UK has legislation banning discrimination on ethnic or nationality grounds, covering situations including "buying or renting property", Singapore offers fewer legal protections. "There is no specific anti-discrimination law that can be used by non-citizens," says Prof Tan. "Even if there is an anti-discrimination law, there is the challenge of proving discrimination… Indication of tenant preferences in rental advertisements may not amount to discrimination." In a statement, PropertyGuru said discrimination on the basis of ethnicity or nationality was "absolutely not" allowed under its guidelines. "There is a whistle-blowing feature for viewers... to report [content] that may be objectionable or derogatory," it said, and objectionable statements would be removed. The Council for Estate Agencies (CEA), a government body that regulates the real estate agency industry, has guidelines stating that agents should "advise their clients against placing advertisements that are discriminatory, offensive or stereotyped in nature against any particular race, religion or group in society". In a statement, the CEA and the Ministry of National Development said: "We do not condone racial discrimination. There are advertising guidelines in place. "Some landlords have explained that they face practical considerations renting out their properties, leading to certain requirements in rental transactions." The statement added: "The Government will continue educational efforts on the importance of mutual respect to preserve ethnic harmony." "With more apartments coming on stream in the next few years, landlords cannot afford to be so choosey," he says. "All the landlords who rejected me were from older generations, but I find I'm not treated differently at work, where the people are younger. I think attitudes are changing, it will just take some time."